Who else is looking forward to series three of The Great British Bake Off starting back on TV next week? I know I definitely am. The nation has well and truly taken the series and the baking buzz to our hearts. As soon as the accompanying books came out in the shops I was straight there to buy them. I have attempted a few of the recipes from the books accompanying the first two series and thoroughly enjoyed making them. Some were easier than others but heigh ho I am always up for a challenge of some sorts. Bread baking is something I’ve always wanted to get into but not had the courage or the ability. I guess I need the technical know how and I would love to book myself onto a breadmaking course in the future. But for now I’m going to test out my ability and hope that the food doesn’t end up in the bin! Last Friday I had been very busy in the Yorkshire Bakery kitchen baking cupcakes. I was really tired and the last thing you want to do is to start trying to make a fancy tea for your family. My hubby is from the breed of men who think a meal is not a meal without meat in it, or that pasta is not a meal. He eats it because if not it’s the takeaway for him or he’ll have to cook it himself. I love pasta and I am not going to stop eating it because he wants steak and chips! I ended up making Pasta Genovese (but it was bought pesto, not homemade) and thinking, well they’ll want something else as well. Last year I remember Paul Hollywood’s technical challenge of making Foccacia on the Great British Bake Off. It looked so complicated yet would be perfect to go with our pasta. I had all the ingredients (or so I thought) and I could fit in the rising, etc around all the other baking I was doing. In for a penny, in for a pound as the saying goes! Paul said in the show and in the book (the recipe is shown step-by-step which was fab for me so I wasn’t completely in the dark!) that you added a lot of water to the recipe and the dough comes out quite wet! That’s normal to me with baking bread dough, my hands get so sticky I’m backwards and forwards to the sink washing it off. So first things first, out came the ingredients. Oh bloody marvellous, I needed 500g strong white bread flour, I had 450g. Oh dear, so had to tip some plain in to make up the loss and hope for the best. I had everything else and I carefully measured the ingredients out into my biggest mixing bowl. The mixture looked like wallpaper paste. Not a good look. After I had managed to knead it for a bit and knock it about the phone decided to ring. Why does the phone ring whenever I’ve got my hands in the mixing bowl? Neither of my children answered it, so I let it go onto answerphone. Then just I get back into it the doorbell goes, it’s one of my son’s friends. Third time lucky then the dog barks at our neighbour coming up the drive. I have a feeling its not going well. Finally, I gave up and chucked the dough in the Kitchen Aid, put it on the slowest setting with the dough hook. I know Paul Hollywood said you should always knead by hand but if I carried on at this rate the foccacia would never get baked. It then got put in my warm utility room for an hour or so (or until it had quadrupled in size). I checked it after 2 hours and it had doubled. Dinner was getting closer so I got it back and put it in the trays to prove for another hour or so. 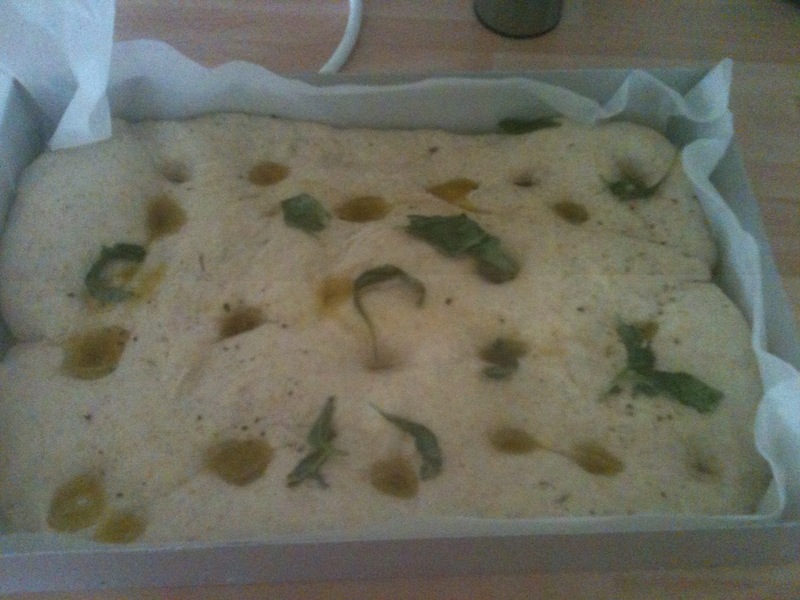 Here is the unbaked foccacia at the end of proving, drizzled with olive oil and with basil leaves chucked on the top. This was the stage where it looked reasonably ok (but probably wouldn’t pass muster with Paul Hollywood) all ready to be baked in the oven. 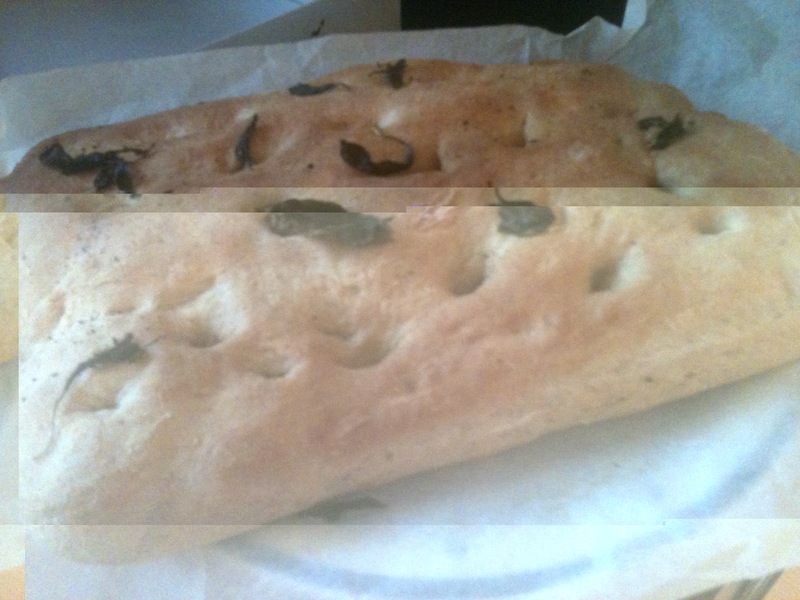 Here is the baked foccacia as it looked when it first came out of the oven. It looked a lot thicker than the ones I have bought from the supermarket in the past. It smelled delicious though and everyone was keen to have a slice. But a mini disaster struck. I cut the foccacia into quarters on the plate and quickly carried it through to our dining room. My dog was lurking about and I tripped over him! One of the pieces of foccacia fell on the floor but before I could pick it up and put it in the bin, Charlie the greedy black labrador picked it up in his mouth! That was my piece gone for a burton! He did eat most of it though after running around with it like one of his chew toys. The verdict? Fun to make despite all the stress but I can’t see Paul Hollywood making me his Star Baker! If anyone else has made the foccacia, I would love to know how you got on!